I admit that I am a Patti Austin groupie. My friends know this about me and will let me know, if I do not know already, when she is coming to town or has new music coming out. About 15 years ago, I met Patti for the first time. It was at the grand opening of Bloomingdale’s in Chicago and she was there modeling a line of beautiful leather suits. It was a wonderful meeting except for having a camera that would not cooperate. I got to ask questions about her music and got my albums signed. I even brought a couple of her early albums just to let her know I was not a newcomer to her music and then came the moment to take a picture with this phenomenal woman. My first and second rolls of film jammed in the camera and the third roll jammed in the camera after about 6 shots. I was so embarrassed because each time I ran through the streets like a crazy man to get new film but Patti was very patient and quite humorous. I have met her a couple of times since the fated camera incident and even dared to bring a camera, fulling working, of course. On Easter Sunday evening, I saw Patti at Kimball’s East. Her current show is called BeboperElla which is a tribute to the music from the Bebop era and celebrating the music of Ella Fitzgerald. It also featured music from her Grammy-nominated album “for Ella.” Her band and backing vocalists were comprised of the very talented jazz students from the Berklee College of Music in Boston. Patti received an honorary doctorate degree from Berklee in 2000. The show opened with a narrative on the lives of Mr. Bebop and Ella and how their lives intertwined. The band’s vocal sextet came out tightly harmonized and scatting to perfection on “Cherokee” which warmed us up for the entrance of Ms. Austin brightly singing “A Tisket A Tasket, followed by the sensual ballad “Honeysuckle Rose” and a tune about that ole mean-spirited “Hard-Hearted Hannah.” The sextet returned to sing about Mr. Bebop “Slippin’ Into Darkness” and how he made his presence known with “Night in Tunisia.” Patti reworked “Mr. Paganini” into a sweet rhapsody paying tribute to ole Bebop and the sextet joined her on a lively version of “I’ve Got Rhythm.” A hush fell over the room and the lights dimmed as she was accompanied by solo piano on the dreamy “The Man I Love.” She was undaunted by a little crackling in the sound system. She continued with the poignant “But Not For Me” and the sextet joined her again on one of Ella’s signature song, “How High The Moon.” They closed with “Birdland” with Patti scatting and singing all the highs and lows. We clapped enough for her to come back out for an encore. She joked that she was on her way to the car. A lady from the audience yelled that she had her first two albums and Patti asked, “What were my first two albums?” The fan referenced “Every Home Should Have One” and Patti said that she made albums years before her duets with James Ingram. The groupie in me could not help but yell out “Havana Candy.” She turned and said, “Yessssss, my brutha! !” and I just laughed. She sang “Hearing Ella Sing” which was written by Patrick Williams for her album and received a standing ovation from a very receptive audience. What a wonderful experience for the jazz students to able to work with such a great talent! Now here comes the groupie again! After the show, I hung around for about 15 minutes waiting for her to come out so I could say hi and get my CD sleeve signed even though “Peaches”, the sound man, had told us that she was not coming out. A few minutes later, she came out and I got my autograph and I told that we had met a few times before over the years, not as if she would remember me. She teased me about the current discussion that Jesus had a brother named James and that I had a heavy burden to carry. My only regret was that she did not sing her gospel flavored version of “Miss Otis Regrets.” She said they could not work it in the context of the show. I thoroughly enjoyed the concert and if she comes your way, go see her because you will definitely be in for a great treat. This entry was posted on Thursday, April 24th, 2003 at 10:00 pm. It is filed under Concert Reviews and tagged with BeboperElla, Ella Fitzgerald, Emeryville, jazz, Kimball's East, Patti Austin. You can follow any responses to this entry through the RSS 2.0 feed. I love what you wrote! I am a Patti nut myself! 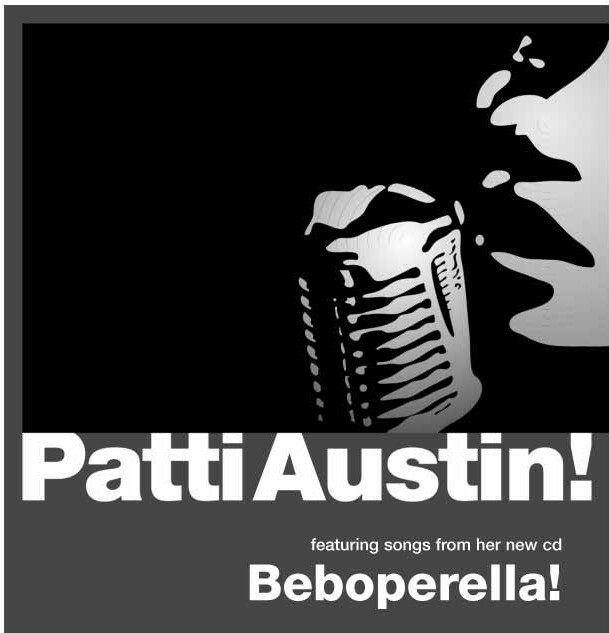 Please come and visit the Yahoo!group for Patti that I founded. We have others like us there who are deeply in love with Patti and crave anything we can get our ears on!! Thank you for sharing your Patti-apreciation. The business itself doesn’t treat Ms Austin as well as it should. However, she is the greatest!